Doctoral students are assessed through a variety of direct and indirect activities throughout their studies. For ELO1, each student's grades for the 4-5 core courses were averaged into one composite grade, then all of the students' composite grades were averaged to report the measured assessment for ELO1. For AY2015-16, the average grade was 3.76, and in AY2016-17, the average was 3.94. ELO2 and ELO3 were measured using the Average of all graduates' final grades for HWRS 513A Field Hydrology. For both Academic Years, all students earned grades of A, so all students exceeded the ELO2 and ELO3, and the measurement is 4.0. ELO4 was measured by the completion of a profesisonal presentation at El Día or completion of an HWRS 696-series seminar course (for MS students). PHD students were required to complete two professional presentations, one of which may have occurred at El Día. All students met this requirement. ELO5 was measured by the grade on a student's thesis or dissertation. The grade of "P" (Pass) is represented with a 3.0, while the grade of "S" (Superior) is represented with a 4.0. For AY2015-16, the average score for all 7 students is 3.29, and for AY2016-17, the average score is 3.14. 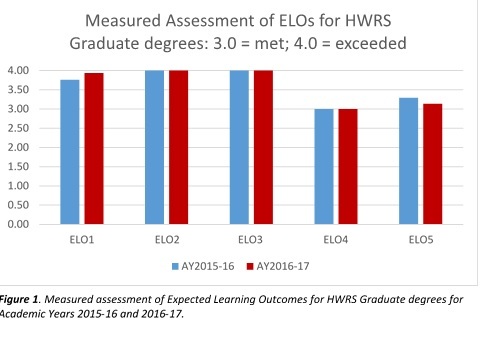 Figure 1 shows the most recent measured assessment of ELOs for HWRS graduate degrees, where 3.0 = Met Expectations and 4.0 = Exceeded Expectations.